Two weeks ago, during a Black Lives Matter protest in Dallas in response to the police shootings of Alton Sterling in Louisiana and Philando Castile in Minnesota, no one expected the protest would end with someone shooting five police officers dead and injuring nine more. But no one was surprised that it happened either. That’s because the last couple of years, since Black Lives Matter was created and officially organized, movement activists have intentionally increased its inflammatory anti-white racial hatred. It has peddled lies regarding the numbers of “unarmed blacks” shot by police in the face of clear statistical evidence to the contrary. It has defiantly increased its anti-cop rhetoric — “What do we want? Dead cops. When do we want them? Now,” “Pigs in a blanket, fry ’em like bacon!” — and has taken to taunting and assaulting officers as these racial extremists “demonstrate” and demand “justice” for blacks who have been, in many cases, rightly shot by police. Black Lives Matter was indeed the catalyst for Johnson to act on his racial anger and paranoia. This is the same group that President Obama — a former community organizer and social agitator himself — has not only frequently praised and defended, but has repeatedly invited to the White House, the last invitation — and meeting — occurring only hours after the memorial service for the Dallas police officers in which Obama himself delivered his politicized eulogy. With all of this in mind, people need a bit of moral clarification. 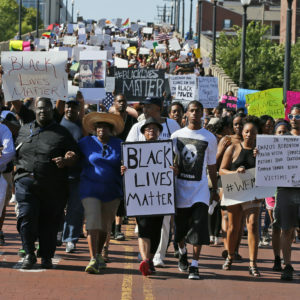 Some have suggested that Black Lives Matter is simply an extension of the civil rights movement, attempting to extend moral justification to an immoral group. But the events of the past week should have answered that suggestion with unblemished certainty. Black Lives Matter movement isn’t a successor to the civil rights movement. To claim so is offensive and it trivializes the character, sacrifices, risks and accomplishments of what civil rights activists were able to achieve with less resources and less rights in a much more racist society. Black Lives Matter unmistakably lacks the kind of moral authority that was present during the civil rights movement. Again, it calls for violence against cops. Further, due to its determined resistance to facts and evidence as it relates to the police-involved shootings of blacks, it has failed morally to convince the consciousness of those outside its racialized bubble as to the sincerity of the cause. The social disruptions of Black Lives Matter are simply hostile demonstrations of racial identity politics and the look-at-us melodrama that descends directly from the black power movement. Despite its claim that “black lives matter,” the only black lives that matter to these racial radicals are members and supporters of Black Lives Matter — at the expense of everyone else. Notwithstanding its professed concern about the small percentage of black criminals, suspected criminals and other blacks shot by police, at its core Black Lives Matter is a pathologically narcissistic movement just like its ’60s-era predecessor. The lack of courageous condemnation of Black Lives Matter by good and decent people ensures more police officers will be shot in neighborhoods that desperately need their presence to ensure the safety of those who cannot afford to leave. Derryck Green is a political commentator, writer and a member of Project 21, a national leadership network of black conservatives. He earned his Master of Arts in Theological Studies from Fuller Theological Seminary, and his doctorate in Theology and Spiritual Leadership with a concentration in Identity Formation from Azusa Pacific University. He wrote this for InsideSources.com. Derryck Green is a speaker and writer whose work has appeared in newspapers and online media across the country. His research includes economic policy, culture and race, religion, theology, immigration, and politics in general. Copyright © 2019 derryckgreen.com. Built by Green T Design. All rights reserved.